There are two types of data used by most geographic information systems: Raster and Vector. 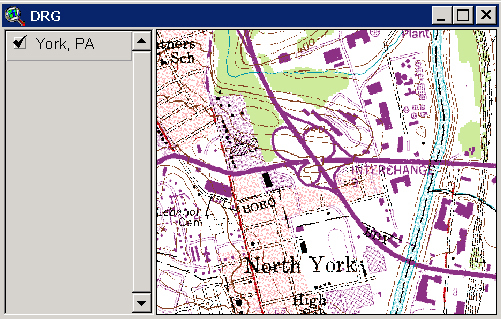 In a GIS, raster data is a cell-based representation of map features. Satellite images, aerial photography and scannned images are all stored in raster format. 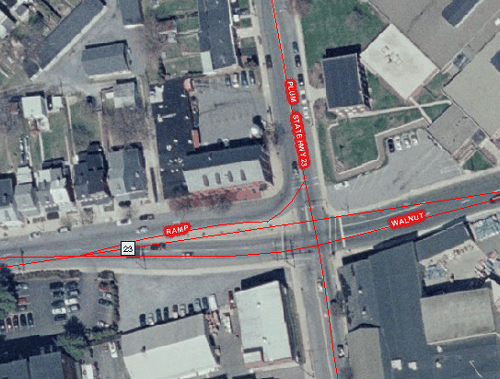 This is a Digitial Raster Graphic (DRG) of York Pennsylvania NE. A Digital Raster Graphic (DRG) is a raster image of a scanned USGS topographic or planimetric map that is georeferenced to a real-world coordinate system. A DRG is useful as a source or background layer in a GIS as a means to perform quality assurance on other GIS layers, and as a source for digitizing and and revising vector data. DRGs can also be merged with other digital data, for example, DEMs or DOQs to produce a composite image. This is Digital Ortho Quarter Quaddrangle (DOQQ) of York Pennslyvania. Orthophotos combine the image characteristics of a photograph with the geometric qualities of a map. DOQQ's serve a variety of purposes, from interim maps to field references for earth science investigations and analysis. Like the DRG, the DOQQ is useful as a layer of a geographic information system and as a tool for digitizing and revising new and existing vector data. Access to the georeferenced Pennsylvania data will be provided to all PA state government agencies; regional, county and local governments within the Commonwealth of Pennsylvania including council of governments; K-12 public schools, state colleges and universities within Pennsylvania. 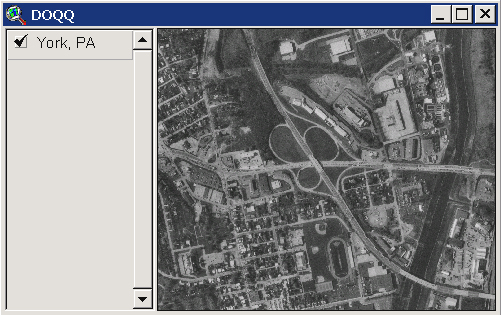 The non-georeferenced JPEG imagery is accessible to anyone for viewing and downloading through PASDA.